THIS JAM-PACKED CRAZY WEEK, PART II: THE FRINGE APOCALYPSE!!! 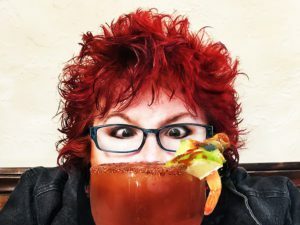 On a recent Thursday, a few days before the 2017 Fringe shows began previewing, I squeezed my Hipster self into a jam-packed Cellar 43 on Cahuenga. This was a party in the series of parties that marks the Fringe season, but it was my first experience of this year’s Hollywood Fringers, and a lively group it was. I’ve been a participant in two Fringes myself as a playwright, but this was a larger and more frenetic gathering than the ones I remembered. I soon ran into Matt Quinn, the producer of the Asylum series of Fringe shows, and he provided me with his own insight into this year’s Fringe. Actually there’s more like 40 new musicals being presented. And 375 productions overall. Yes, that’s right, 375 productions! Most being done for no more than 3 or 4 times. In a city where traffic jams and parking are already a nightmare, that may indeed qualify as an apocalypse, if not the apocalypse. I spoke to many people that night, including a lady who was giving out bags of peanuts to promote her performance of Allan Sherman’s songs – she and I were the only ones there who knew who Allan Sherman was (“Hello Mudder, Hello Fadder”? No?) but I still didn’t get the connection with peanuts. And countless hopeful aspiring artists – literally, I completely lost count – all of whose shows I promised to attend. And I meant it. I started off fast, going to two shows on the first night – TOO MANY HITLERS and MR. MARMALADE. I was actually intending to see “Doctor Faustus,” as its star, Brando Cutts, was one of the artists I had spoken to at the party. But his show started at 11 pm, and I couldn’t quite see myself soaking in Christopher Marlowe’s heroic verse play at that hour, no matter how condensed it was. I must admit that I faltered later in the week, as life and lack of sleep caught up with my best intentions, and traffic was indeed a nightmare, preventing me from getting to the early shows on time. But here we are, doing the best we can to make you aware of the often-amazing work going on all around you. Here’s a roundup of five shows, with many more to come. Yes, miles to go before I sleep, miles to go before I sleep…as I finish writing this at 5:38 in the morning. When was it exactly that Hitler became funny? Was it when Charlie Chaplin lampooned him in The Great Dictator or when Mel Brooks lampooned all the Nazis in Springtime for Hitler? To give some perspective, I was horrified the first time I saw both in the late ’60s. I am a very secular Jew, but Hitler and his hench-people attempted to wipe out my people, and that’s never struck me as very funny. By the early 1970s I had become hip to the brilliance of both – Chaplin made his movie without knowing about the extermination camps, and Mel Brooks is just the sharpest and fastest comic mind we’ve ever had. But a part of me still stands with Mike Nichols, who came to the US from Germany when he was four and would never direct any play or movie with a Holocaust theme. That’s more severe than me – I’ve actually written a play with that theme (The Kitchen Girl), and I feel like the emotional after-effects of this cataclysmic event are important to write about. The pop culture aspect, though, not so much. And there’s so much of it! So much! I had been hearing about Mr. Marmalade for a few years now, and so I was glad for the chance to catch it at Sacred Fools at 10:30 at night – probably the perfect time to see this funny and disturbed play. First off, let me say that the entire cast is excellent, led by Melody Ricketts, playing four year old Lucy who is wise beyond her years and haunted by dreams both horrifying and terrifying, that mimic adult tragedies but that only children can see. Melody is innocent and jaded in equal measure and in just the right ways. Miles Berman is also a standout as Larry, Lucy’s playmate, who is also plagued by scary imaginary characters and by real suicidal urges as well. Paul Major is also very good as Mr. Marmalade, Lucy’s imaginary businessman-friend, who is presumably a replacement for her father, not mentioned in the play. While there are many fiendishly funny twists and turns, the overall effect is a sad one. Is it an indictment of a sick and twisted society or is it about childhood and all the fears and terrors that reside there? Or both? Go see the play and decide. 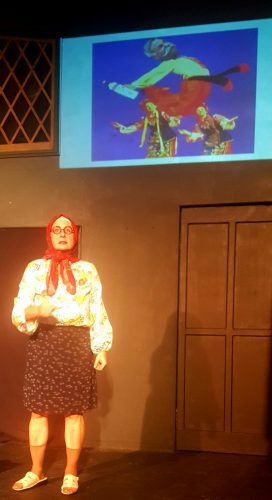 I watched this very funny one woman show – or is it a takeoff on a one woman show? – with a sold-out house of enthusiastic fans, who giggled and howled at every deadpan-delivered “joke.” The conceit here is that Baba Barraboulya (played by Trina Shpur) has come over here from “the old country” of Ukraine to stay with a succession of American relatives, each of whom is more eager than the next to get rid of her. Trina has constructed a very funny persona of a fish out of water – a yokel from the old country who makes a fool of herself time and again with American manners and institutions, such as the time she goes to the super market and tried to haggle over every item with the person at the cash register. At bottom, though, her character has hold of a life force that gets her through even the worst embarrassments and will clearly help her outlive us all. Some of the more obvious jokes in the middle of her one hour routine fell flat, and Baba’s habit of yelling at her numbskull nephew to change the slides gets old really fast. But Trina has enough of that life force herself to outlast her less funny material and make the experience feel like a triumph. Besides that, everyone gets a shot of real potato vodka (very yummy!) and a small pierogi and slice of sausage. No wonder the house was so full. I’m sure as Trina keeps working on this material, her character will become even richer and more memorable, even as she remains very funny. Wishing you well with that, Baba! Veteran jazz guitarist has been there and back, and he has lived to tell the tale. He is the living definition of a craftsman, who has devoted his life to studying jazz guitar legends like Wes Montgomery and Django Reinhardt, and studying with jazz legends like Sonny Rollins and Ray Brown. When Clint Eastwood needed a jazz craftsman to help him with some of the recordings for his movie about Charlie Parker, Bird, who was it he turned to? Bruce Forman, of course. Bruce has some stories to tell from his lengthy career, and The Red Guitar gives him the chance to tell them. And it’s an absolute pleasure to hear him play. That said, it must be added that Bruce is not the most charismatic of stage personalities, and a little more pizzazz would have gone a long way to making “the Red Guitar” something haunting and memorable – like “The Red Shoes” and “The Red Violin” – and not just a pretext for hearing some great tunes laid down by a master. But hey – why pass up any chance to hear a master at work? Only one show left, on Friday June 16 at 9 pm. It’s a very small house, so don’t miss out. This is without a doubt the most powerful piece I’ve seen so far in the Fringe, and I hope it garners a large following. A 75 minute exploration of a tragedy very similar to the Pulse Nightclub shooting of a year ago, it captures this shattering event in very human terms while also daring to bring in a strong spiritual element too – spiritual as opposed to religious, which comes in for some very pointed criticism. In a strong cast, Ethan Rains, Rachel Sorsa, Tania Verafield and especially Dylan Arnold stand out as characters caught in the headlights of history and in a struggle that isn’t their own – until it is. The double-casting of several actors works very theatrically here, especially with Ethan Rains, who plays both the mass-murderer and a deeply-sensitive and loving gay man – and he is equally effective at conveying the essence of both. Elina de Santos does a wonderful job in letting the play find its rhythm, but she somehow leaves out the joy and celebration that would be everywhere in this gay nightclub. Even the characters in the poster are dancing – how come there’s no dancing onstage? It doesn’t make any sense, and it causes the production to miss an important point about the jealousy and anger that such unabashed joy breeds in those incapable of taking part in it. It’s also a missed opportunity theatrically, as the dancing would add a mesmerizing element that could break up the excessive wordiness of some of the dialogue. Hopefully this will be incorporated down the line with a play that has so much to say to our time about the difficulty of being vulnerably human in a world filled with hate. July 2, 2017 FRINGE BINGE 2: HERE'S TO EVANESCENCE!